PHILADELPHIA - A 19-year-old facing felony assault charges for allegedly beating a ranger at a park in Philadelphia last month was in court Thursday, reports CBS Philly. Authorities said Curtis Tanner is the man captured on cellphone video beating the unidentified 35-year-old ranger at Love Park on Aug. 15, according to the station. 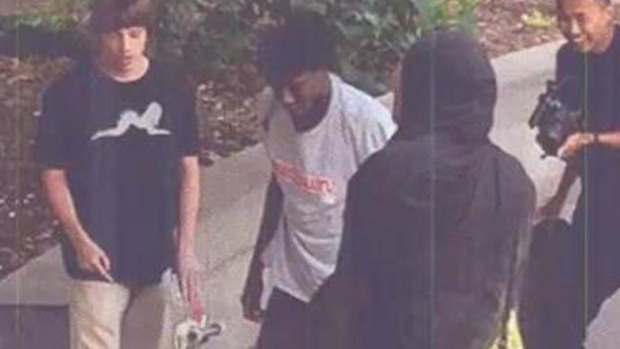 The nearly two-minute video - which shows at least three skateboarders, allegedly led by Tanner, brutally punching and kicking the park ranger - was viewed by Judge Nazario Jiminez Jr., at the request of the prosecution. CBS Philly reports that the victim, who was also in court, repeatedly shook his head and tried to look away as the footage was played. Tanner and a 17-year-old suspect, whose name is being withheld, were arrested a few days after the attack. Assistant District Attorney Joseph Whitehead said this was the first time the ranger, who has spent seven years working in the city, feared for his life while on duty. "I don't think things have gotten so bad in our city that a park ranger should accept a consequence of his job is that he may get pummeled, kicked in the head and spit on," Whitehead said. The victim testified that he tried to enforce a no skateboarding rule, but Tanner and his associates didn't listen. The ranger said Tanner kept talking trash and then attacked him as he was trying to back away, according to the station. Whitehead said his client was "concerned about what it would mean for his job if he actually got into a fistfight or altercation." The defense argued the victim did not identify himself as a ranger to Tanner and his friends. In his testimony, the ranger said he was not wearing his badge that day, though he was wearing the rest of the uniform. The station reports the ranger was checked out at Roxborough Memorial Hospital after speaking to police about the attack, but was not badly injured. At the defense of the request, the judge reduced Tanner's bail from $250,000 to $10,000, CBS Philly reports. The prosecution had requested bail be increased to $350,000. Whitehead argued Tanner has been arrested six times since April 2013 and also attempted to get the felony aggravated assault charged bumped up from second to first degree. Both motions were denied by the judge. Tanner is also charged with simple assault, recklessly endangering another person and making terroristic threats.